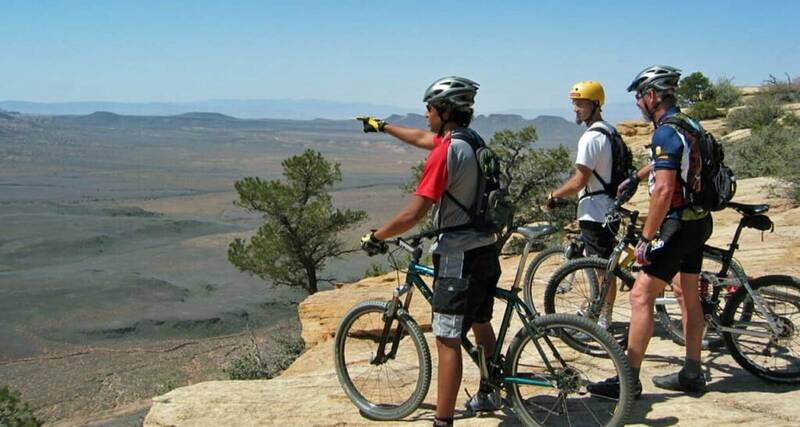 Spend a day with a mountain bike guide and explore Gooseberry Mesa. We’ll expose you to the Slickrock practice loop and link doubletrack and singletrack trails to some amazing views of Zion National Park and the surrounding Colorado Plateau. Gooseberry also serves as a great place to discuss the geological history of the area with views of old lava cinder cones and an abundance of trailside petrified wood. We will spend our time exploring the Slickrock mazes that makeup Gooseberry Mesa. Our trips are set up as privately guided trips. This means that you will not be stuck with others who might impact your experience adversely. We do allow folks the option of open group trips to save money. We offer all loop options. Based on your riding abilities and willingness to ride hard we will do as much as we can. Beginner to intermediate riders can ride double and singletrack and test their newfound skills on the Gooseberry Practice Loop. All riders can benefit from proper body mechanics and weight distribution as it applies to Slickrock. Our guides are well versed in all riding techniques and can assist with increasing your skill level. All riders will be briefed on the mechanisms and components of their state of the art mountain bike before we start to ride. Your guide is also well versed on the local area and can interpret much of what you see. If you have a question just ask. A local knowledgeable mountain bike guide. Transportation of bikes- Occasionally we ask folks to drive to the trailhead, but we transport the bikes. Bring all of your things that you want to take into the shop.